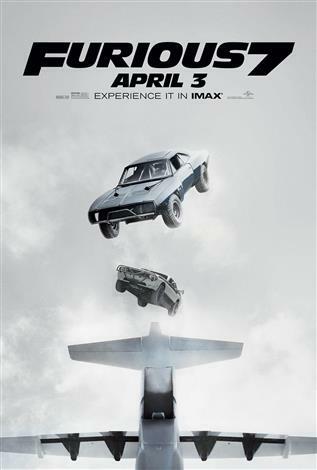 The IMAX release of Fast & Furious 7 will be digitally re-mastered into the image and sound quality of The IMAX Experience® with proprietary IMAX DMR® (Digital Re-mastering) technology. The crystal-clear images coupled with IMAX's customized theatre geometry and powerful digital audio create a unique environment that will make audiences feel as if they are in the movie. Continuing the global exploits in the unstoppable franchise built on speed, Vin Diesel, Paul Walker and Dwayne Johnson lead the returning cast of Furious 7. James Wan directs this chapter of the hugely successful series that also welcomes back favorites Michelle Rodriguez, Jordana Brewster, Tyrese Gibson, Chris “Ludacris” Bridges, Elsa Pataky and Lucas Black. They are joined by international action stars new to the franchise including Jason Statham, Djimon Hounsou, Tony Jaa, Ronda Rousey, Nathalie Emmanuel and Kurt Russell. Neal H. Moritz, Vin Diesel and Michael Fottrell return to produce the film written by Chris Morgan.